L-R: Pharm. Elijah Mohammed, Registrar, Pharmacists Council of Nigeria (PCN); Pharm. 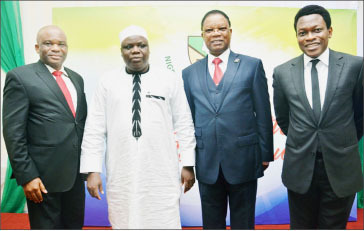 Ahmed Yakasai, President, Pharmaceutical Society of Nigeria (PSN); Prince Julius Adelusi-Adeluyi President, Nigeria Academy of Pharmacy and Calixthus Okoruwa, Chief Executive Officer, XLR8, at the investiture of new fellows of the Nigeria Academy of Pharmacy which held at the Lagos Sheraton Hotel, Lagos. To tackle inadequate funding, lack of constant power supply and non- availability of reagents which have been identified as Fellows2challenges for Research and Development (R&D) in Nigeria, the Federal Government has been tasked to increase its commitment in the area. Specifically, Professor Isa Marte Hussaini, a world-renowned cancer researcher and professor of pharmacology at the University of Maiduguri has called for greater commitment on the part of the government to the funding of research in the country. Professor Hussaini said this while delivering his keynote presentation at the investiture of six professionals as fellows of the Nigeria Academy of Pharmacy, weekend. The celebrated researcher lamented: “Inadequate funding is still a big challenge for Research and Development in Nigeria, as well as lack of constant power supply and non- availability of reagents which we have to buy from US and UK. “We need more research grants in our country; it is not about the personnel but the tools to work with. All over the world, there are Nigerians who have distinguished themselves in the field of medicine,” Hussaini stressed. Prof. Hussaini whose cancer research is exploring the use of local herbs in cancer therapy reminded the audience that “cancer is the second leading cause of death globally, the first being cardiovascular diseases with 8.2 million deaths reported worldwide as at 2012. Yakassai also announced the establishment of the PSN Foundation which would be launched in Abuja on October 17, while noting that the 90th celebration of the PSN scheduled to hold in Umuahia would be a grand, epoch making occasion for all pharmacists. He described pharmacy as the bedrock of effective healthcare delivery in the country and the most trusted healthcare provider as well as a driving force behind the discovery of new drugs. The six distinguished professionals which the Academy inducted in Lagos are; Prof. Karniyus Gamaniel, Director-General, Nigerian Institute for Pharmaceutical Research and Development (NIPRD), Prof. Herbert Coker, former deputy provost, University of Lagos(UNILAG); Dr. Ogori Taylor,one-time national pharmaceutical advisor, World Health Organisation; Prof. Mojisola Adeyeye, first African woman to bag the fellowship of American Association of Pharmaceutical Scientists (AAPS) in the US and Professor of Pharmaceutics; Dr. Teresa Pounds, Pharmacy Residency Director, Mercer University College at Atlanta Medical Center and Calixthus Okoruwa, communications management consultant and CEO XLR8. The Academy, which has been in the fore-front of educating, mentoring and motivating young pharmacists in partnership with the PSN and other health professionals, recently organised a workshop on inter-professional collaboration in the country’s healthcare sector. Eminent persons who attended the event are; Pharm Elijah Mohammed, the Registrar, Pharmacists Council of Nigeria; Senator (Prof. )Olusola Adeyeye, Senator representing Osun Central Senatorial District; Prof. Fola Tayo, General Secretary of the Academy; Sir Ifeanyi Atueyi, Vice President; Pharm. Nnamdi Obi, Chairman, Association of Pharmaceutical Importers of Nigeria (APIN); Mazi Sam Ohuabunwa, former managing director, Neimeth Pharmaceuticals, among others.